Asics' marketing pitch: Smooth ride and comfortable fit. Upper: Mesh, no-sew synthetic overlays. 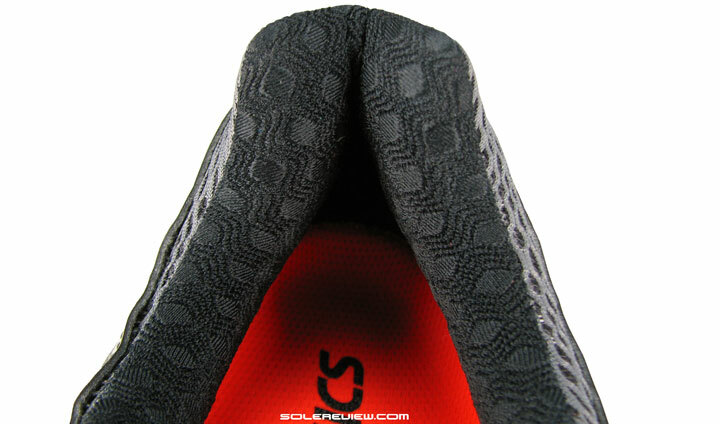 Midsole: Dual density midsole with forefoot and heel Gel inserts. 10 mm heel to toe drop. Widths available: D-standard (reviewed), 2E (wide) and 4E (extra wide) in select colors. The ride gets softer at the cost of transition. 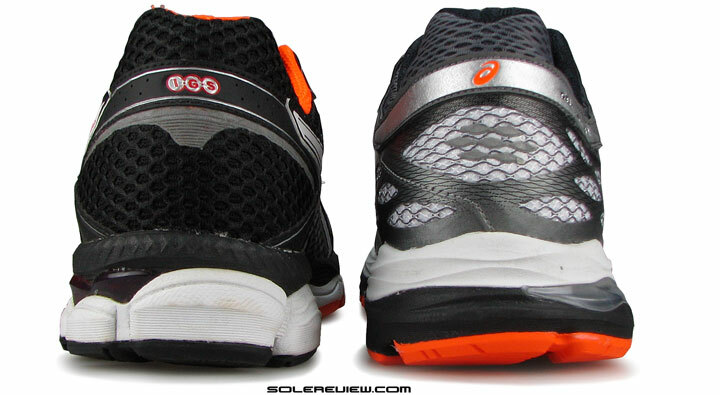 Forefoot gets narrower, yet the upper is an overall improvement. The Cumulus – one of the many faces in the ‘neutral cushioning’ crowd. Within the industry, the neutral running category – broadly classified as shoes with no medial midsole posts – can be quite the crowd to wade through. Nearly a dozen brands compete to hawk their (foot)wares, each model representing a different interpretation of the neutral cushioning notion. A busy mix of proprietary cushioning systems, upper construction techniques and fit variations sees to it that no two shoe models end up exactly the same. But if you have an inkling of what you’re buying, this problem of plenty can actually work to your advantage. Want a firm riding, built-up and supportive neutral with nice upper materials? The Brooks Ghost 8 might just be the shoe. Like some pep in the cushioning, and reasonably lightweight? The adidas Glide Boost, Nike Pegasus and Saucony Ride do the trick for you. How about a shoe much firmer and supportive? The Mizuno Wave Rider fits the bill. The Cumulus has a distinct character, separating it from its peers. And if one wanted something old school, with a legacy design, soft cushioning with a high heel drop, plastic midfoot shank and a weight ballpark of 12 oz, then you had the Asics Gel Cumulus at your service. 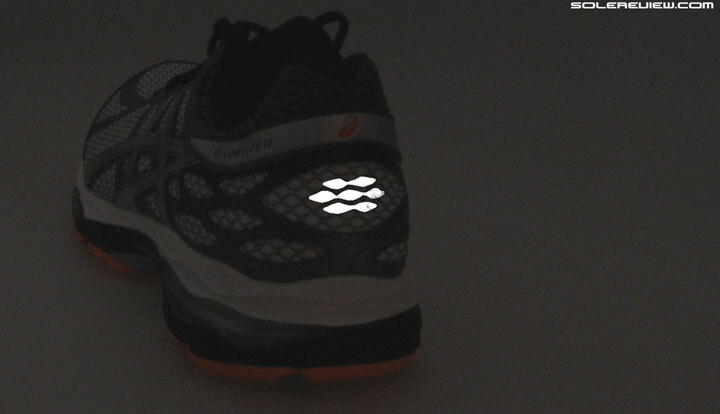 Not very responsive, nor lightweight, but nonetheless occupies its own personal place in the running shoe ecosystem. Meet the Nimbus 17 – the Cumulus 17’s more expensive, plusher, softer riding version. Like the Kayano and GT 2000 in the motion control category, the Nimbus and Cumulus pairing has been there as long as we remember. The more expensive Nimbus is the Japanese brand’s premium cushioning model, justified by a much softer midsole and a luxe material package. In a sense, the $120 Cumulus is a watered down Nimbus, and goes head-to-head with some of the other neutral models mentioned earlier. Of late, Asics is hell bent (for reasons known to them) on transforming many of its models into ultra-soft cruisers, evidence of which can be found on last year’s Kayano and the candy-floss soft Nimbus 17. 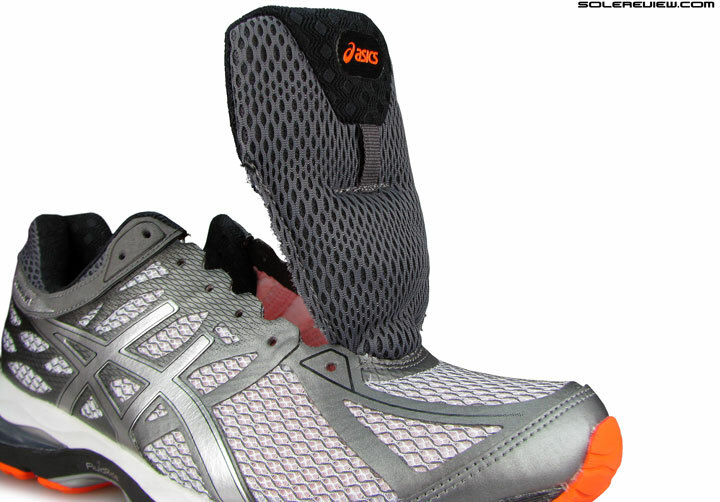 For a certain period, Asics stuck with a middle path approach as far as cushioning was concerned. 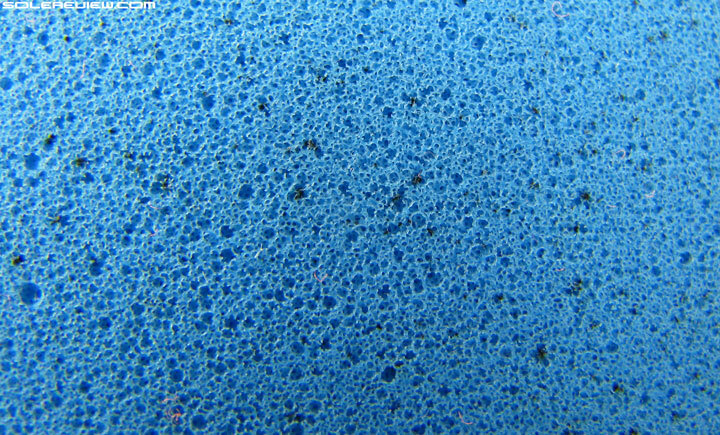 One would experience foam softness, but more often than not, the ride was blended with a tinge of firm. The Nimbus 14 and 16 were good examples of that in action, and so was the Cumulus 16. Not the best of materials was used on the Cumulus 16, but the ride was pleasantly balanced. Though a bit lacking in aesthetic niceties, the Cumulus 16 excelled in delivering a balanced sense of cushioning. The rearfoot did not feel significantly softer than the forefoot, and vice versa. The upper materials came across as a bit crude, however. Some of the layering was downright tacky, and felt out of place on a $120 shoe. We have to admit, it’s a bit more fun to review new Asics and Brooks models each year, and that’s because of their design update cadence. Rest of the brands change only their upper design annually, and the sole design biennially; but for these two brands, most of their models go through a full makeover cycle each year. Not saying that a complete annual design refresh is either mandated or necessarily better, but the element of discovery turns out to be more exciting and oddly satisfying for a shoe reviewer. 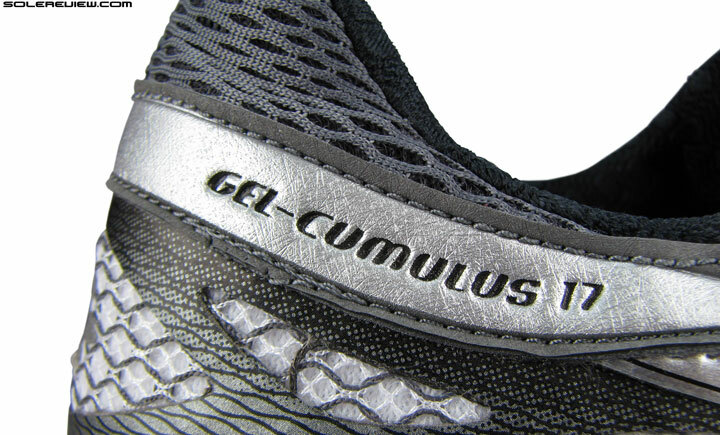 Any guesses what changes on the 2015 Gel Cumulus 17? 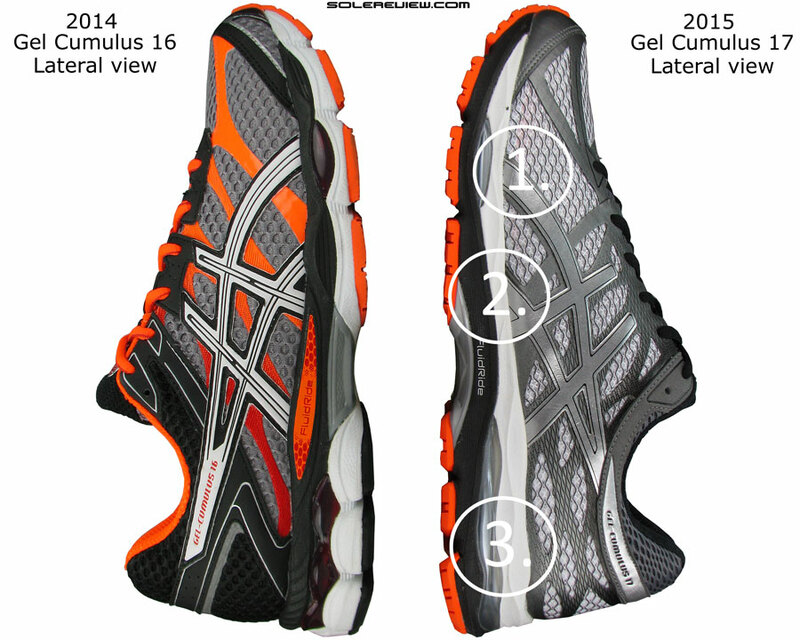 If you’ve read our Kayano 21 and Nimbus 17 review, then you’ll have a fair idea of what happens to the Gel Cumulus. 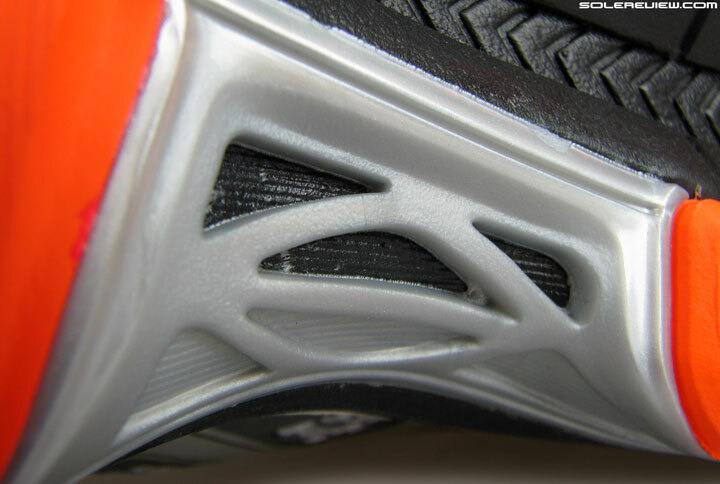 It rides softer than before, made possible by a combination of design changes in the lower parts of the shoe. And what may those structural updates be? 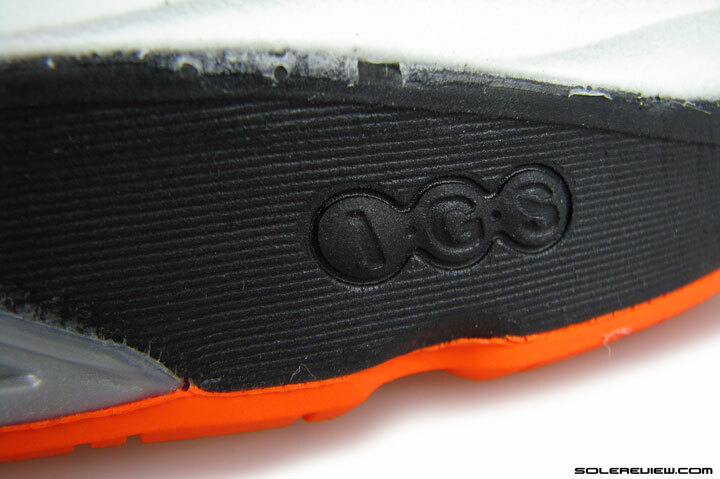 The design of the insole stays the same as that on the Cumulus 16’s. Unlike the Nimbus, Asics decides to leave the foam lasting material untouched on the new Cumulus. The construction basics across both versions stay the same. 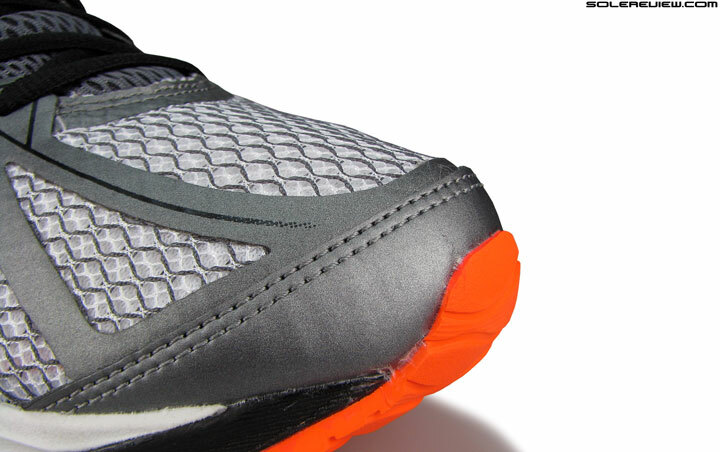 The midsole has a dual stacking of two foam layers which sandwich visible Gel windows under the forefoot and heel. A drop-in sockliner/footbed is standard, and if you lift that, the blue foam lasting comes into view. Asics calls this strobel material SP45, and unlike the Nimbus 17, which recently made the switch to an open-celled (softer) foam, the Cumulus prefers to keep this part unchanged. 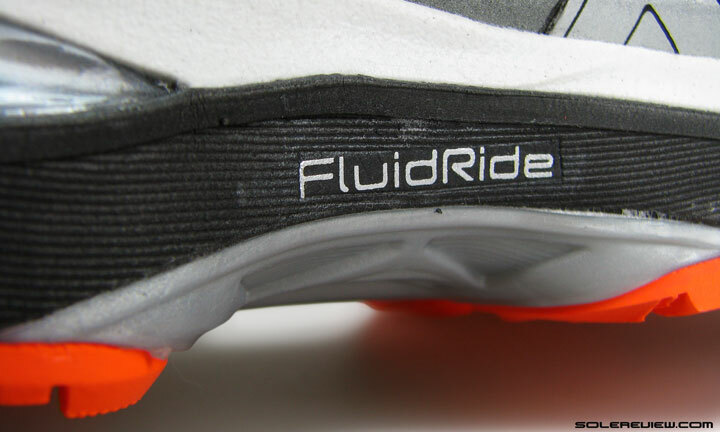 1) Wider channels between forefoot rubber lugs, which has its drawbacks 2) Redesigned plastic shank 3) Updated crash pad and much wider ‘Guidance line’. 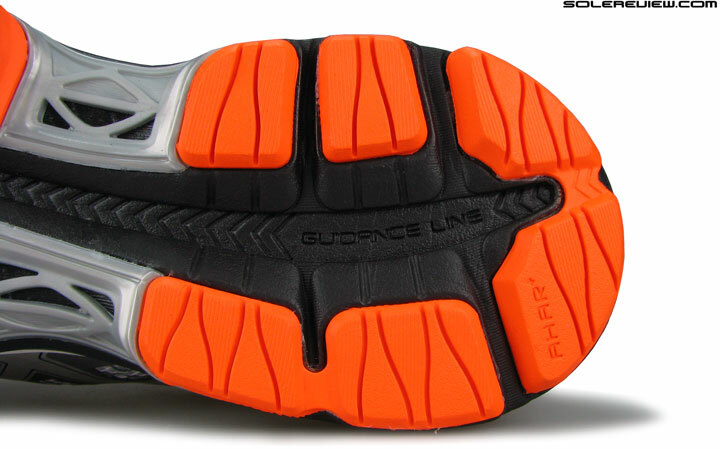 On the bottom, the outsole configuration is a sight similar to that of the Cumulus 16, barring a few tweaks. The ‘guidance line’ – the chasm which runs from heel to toe between the medial and lateral outsole halves – is made wider than before. Meaning there’s increased open space running along the center, compared to the tighter groove on the Cumulus 16. 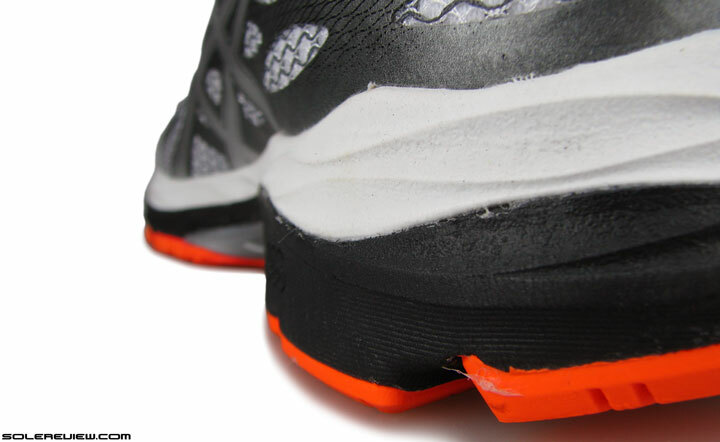 The midfoot shank now fills in the exposed foam gaps, or ‘bridges’ the outsole bits. 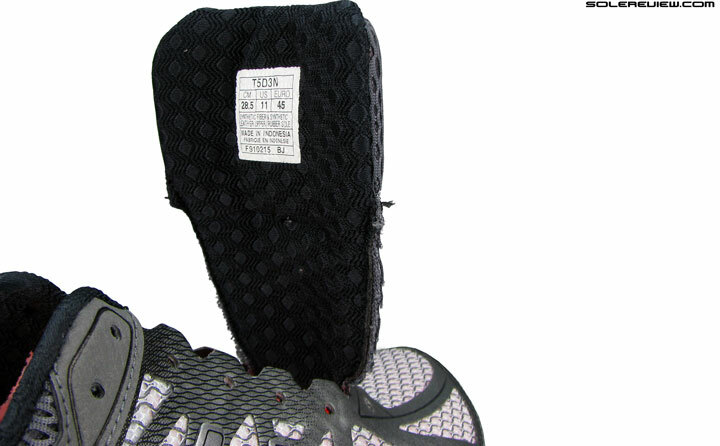 What’s more, the heel crash pad is designed to be larger than before, and the lateral side of the plastic shank is filled up with more plastic, bridging the gap between the rubber ends. So if you compare both versions of the Cumulus’s sole units on the basis of looks alone, very little seems to have changed. Yet most of the functional updates happen within the inner workings of the sole components. The lower midsole is molded softer than its equivalent on the Cumulus 16. Squish goes the insole, too. For example, the lower part of the midsole – colored in black on the Cumulus 17 – is molded softer like-to-like vs. the Cumulus 16. The Gel units are softer in hand-feel compared to the Cumulus 16’s units, and the insole is softer, regardless of the same design. 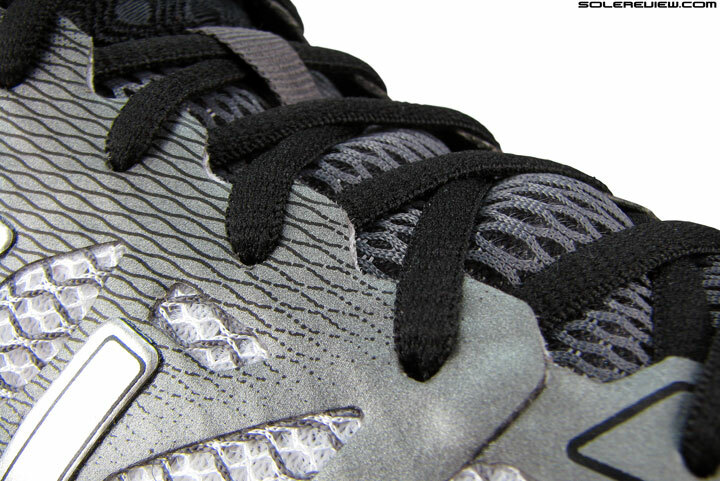 The outsole geometry has a say in the cushioning change, too. Like the C-16, the bottom is made of two different materials. The heel has these harder rubber lugs, and the front is underlined with softer blown rubber. Only in this instance, the blown rubber slabs come with increased softness. The difference in density was evident in both the padding quality and the rate of wear, which was higher on the Cumulus 17. 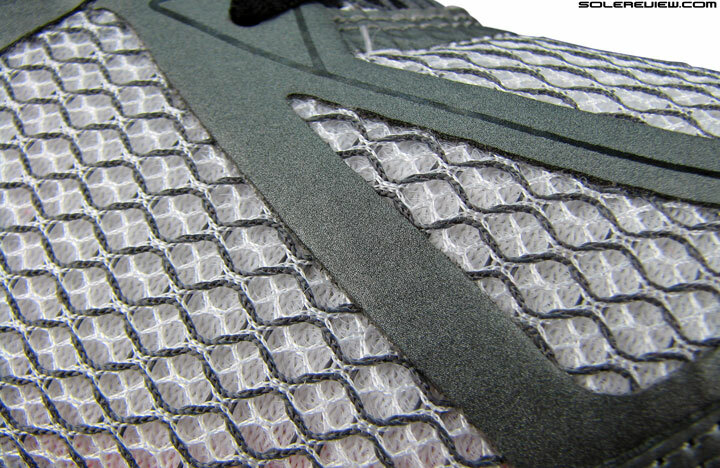 More rearfoot splay because of the changed crash pad and increased area of exposed midsole foam. There are a few more aspects which influences the ride character. 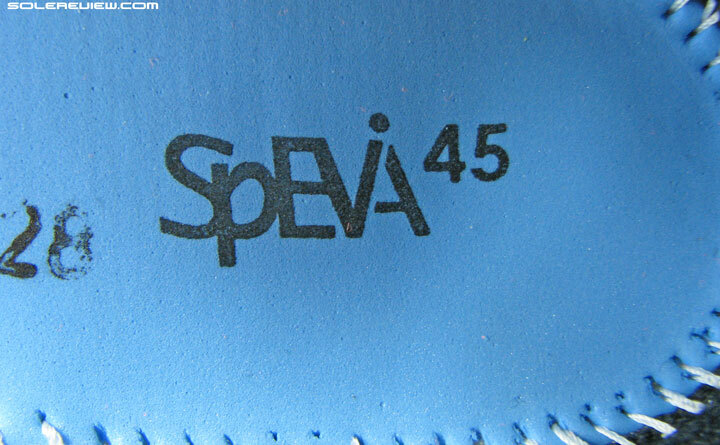 Because of the increase in the heel crash pad’s size, there is a larger section available to splay on rear-foot strike, hence amplifying the cushioning sensation. And then one has to take into account the newly designed ‘guidance line’ which is now wider and amplifies the soft feel. The Guidance line is much wider, right from the heel to late forefoot. With a wider groove separating either outsole sides, the center has a greater tendency to splay and compress downwards on weight loading. All of these changes work together to deliver the effect of increased softness over the Cumulus 16 design, which relied on a narrower Guidance line and firmer materials. 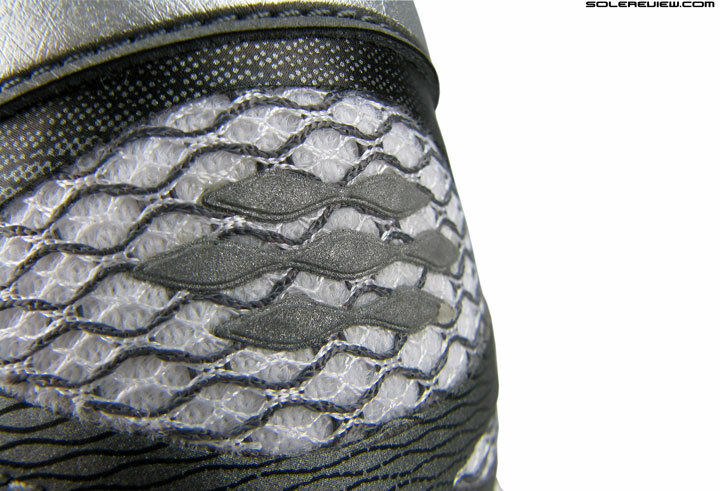 Zoomed up view of the Cumulus 17’s open-celled foam insole. The art of soft isn’t confined to the rearfoot; the Cumulus 17 brings changes under the forefoot too, impacting the ride character. In the front, the softer blown rubber pieces, the wider groove and lower density midsole and insole combine to deliver a softer ride. The Gel windows get the smoked and sleeked-out treatment, and becomes softer while at it. At the back, it’s the softer layers of foam, bigger crash pad and softer Gel coming together. 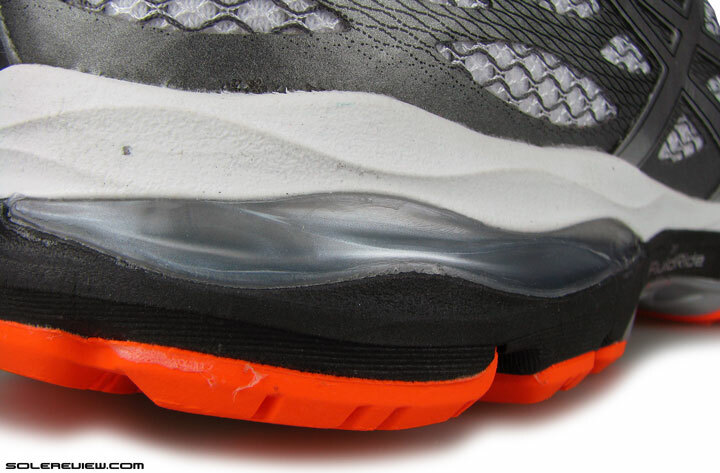 Though the visible Gel window only has a small part to play in the overall cushioning feel, it likely contributes to how the lateral heel feels under loading. 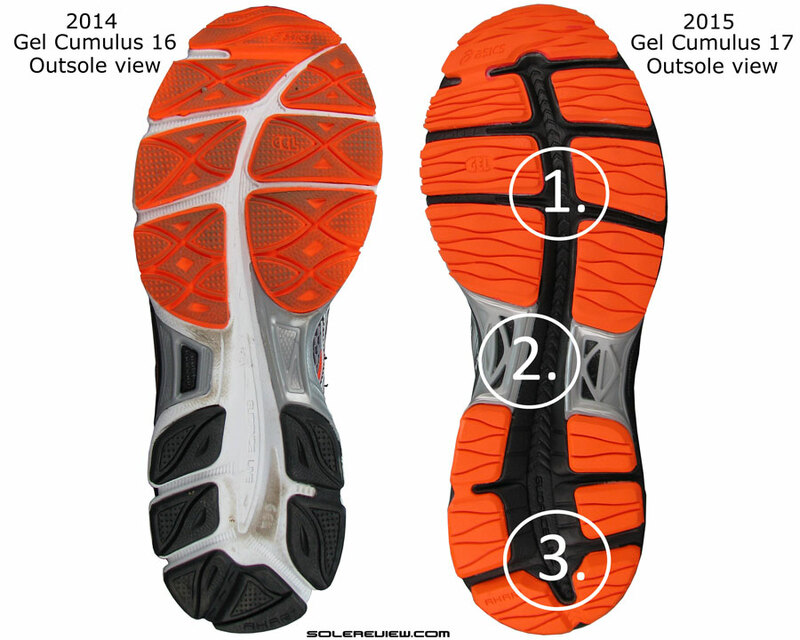 The primary cushioning agent in all Asics Gel shoes is the midsole foam, and not the eponymous jelly like insert, like Asics would have you believe. The forefoot Gel window is a mere decoration, but for whatever it’s worth, they get softer too. 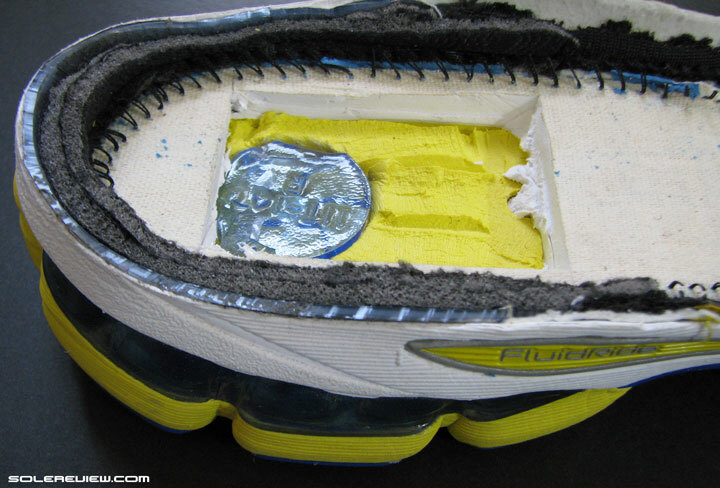 Gel use is limited to the periphery of the midsole, and inside there’s more foam than Gel. The forefoot Gel is a mere decorative eyewash, we think its placement to be absolutely useless from a performance viewpoint. So while it is true that the Cumulus 17 ends up being a softer riding version of the previous version, there are three parts which feel markedly different from the 2014 Cumulus. The first part concerns the forefoot. Since the foam gets softer and the transition groove wider, there’s decreased insulation between the foot and the outsole rubber. So even the simple act of loading your forefoot results in the pressure being transferred from the corners of the outsole slab below. One of our readers commented on facebook that ‘it felt like there was a pebble inside the shoe’. While our experience wasn’t so pronounced, we could feel the faint pressure outline from the outsole below. This feel will depend on one’s footstrike or loading patterns. Rearfoot strikers might get to experience a lesser version of this, while forefoot strikers and heavier runners might sense a higher intensity of this behavior. 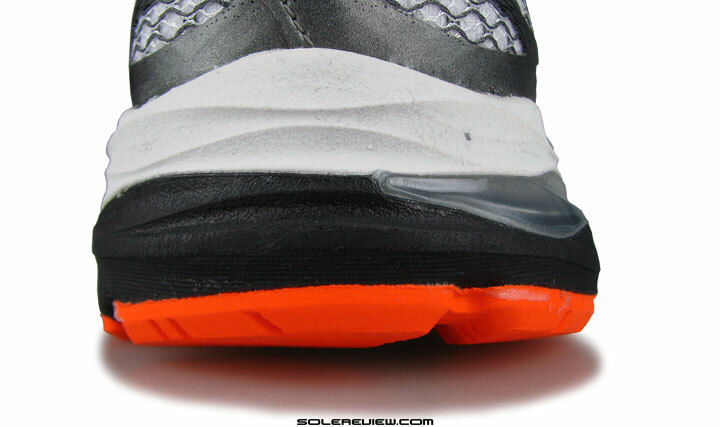 The forefoot cushioning feel has a few gaps, literally speaking. A lot of newness is packed under the Cumulus 17’s rearfoot, so the balance of cushioning gets unsettled. The heel comes across as much softer than the forefoot, a sensation of more sink if you will. This is in contrast to the Cumulus 16’s more balanced stance, where the difference between the heel and forefoot softness wasn’t as pronounced. The third facet of the Cumulus 17’s ride is its transition quality. The softer and wider ‘guidance line’ has a newfound tendency to travel lower than the version on the Cumulus 17, which results in the shoe feeling sluggish when compared to the Cumulus 16. 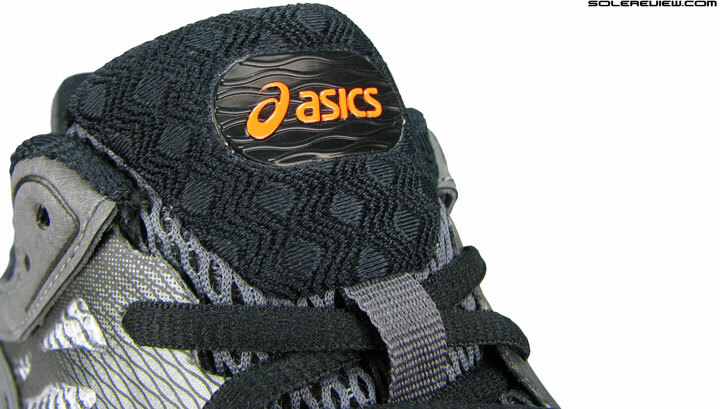 Asics’s trademark guidance groove made its debut when its shoes were much firmer, and thus more relevant in facilitating transitions. Throwing in a wider gap on a softer midsole achieves the exact opposite really, and the ‘Guidance line’ falls short of its namesake goal. In our opinion, last year’s Cumulus had just the right amount of cushioning. Though responsive is not an adjective generally associated with Asics, in a purely contextual sense the Cumulus 16’s midsole felt more responsive than the 17. Supportive lower midsole base, with a hint of lateral (outer) cushioning bias. 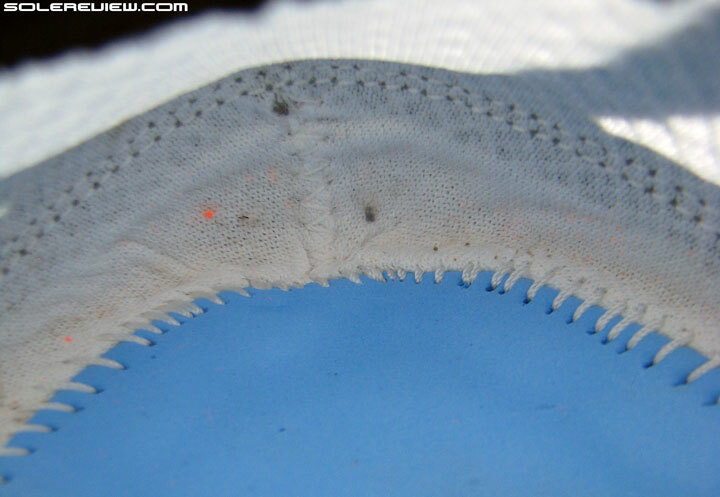 The medial (inner) sidewalls are devoid of Gel windows, and does not excessively deform upon weight loading. Nonetheless, the Cumulus 17 retains the supportive aspect of the ride. There wasn’t any midsole bias on the Cumulus 16, and you won’t experience a lot of it on the 17th version either. 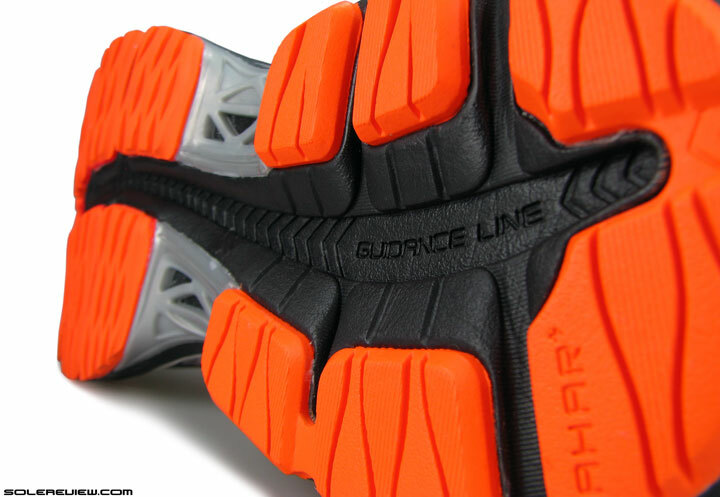 The midsole sidewalls offer adequate support on either sides, and the wider splay of the guidance line keeps weight loaded in the center. The Cumulus 16 (left), vs. the Cumulus 17 (right): The design has changed, and so has the ride. Hence in a nutshell, the new Cumulus 17 is a softer Cumulus, following the evolutionary footsteps of its bigger brother, the Nimbus 17. It is a good shoe for the long and easy, but if you wanted something similar yet slightly more efficient, then picking up the firmer Cumulus 16 is a good idea. The Cumulus 17 stays in its weight class; the 2014 version was only 4 gms or 0.1 Oz lighter, so nothing has changed there. 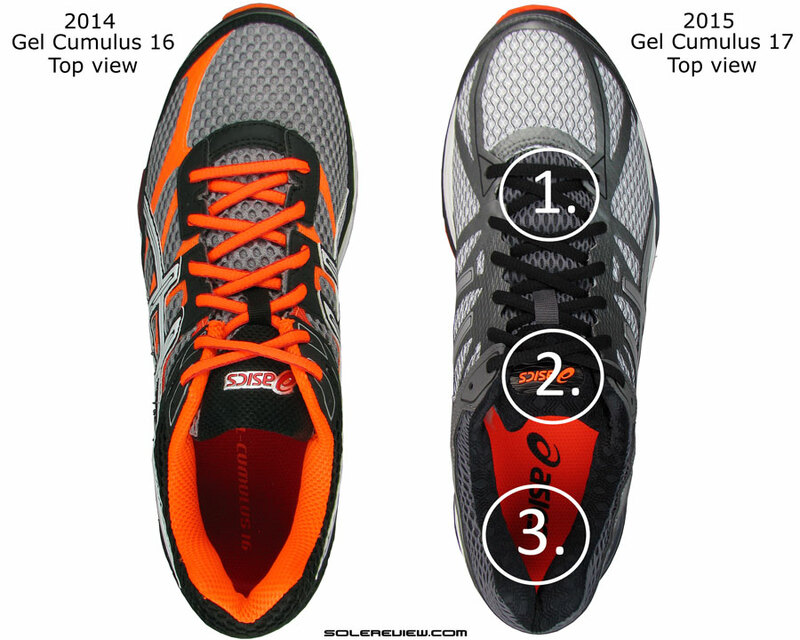 Numerous updates have been applied to the new Cumulus 17 upper, affecting the material feel and fit quality. 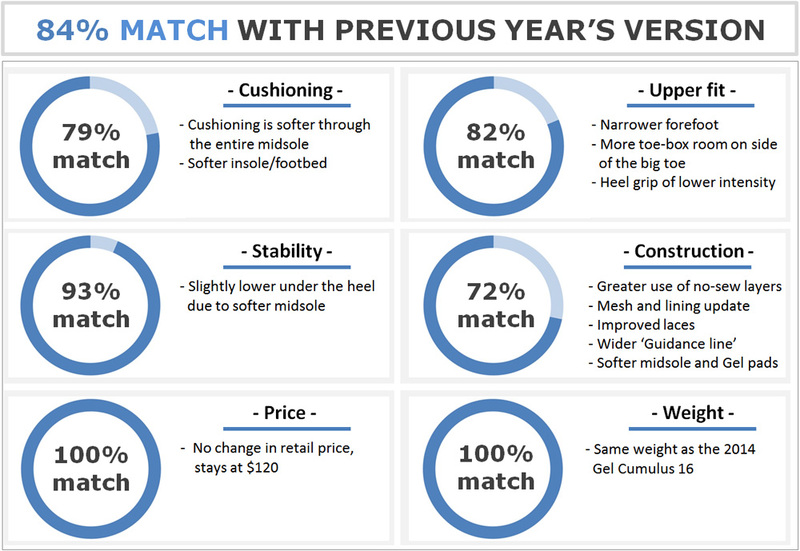 Of all the changes, the forefoot fit’s alteration sticks out the most. The Cumulus 17 fits narrower than the 16th version, but for reasons we’ll explain soon, that isn’t a bad thing. Textile used here is smoother than the Cumulus 16’s material. Has a nice hand feel, though the padding inside hasn’t changed much. 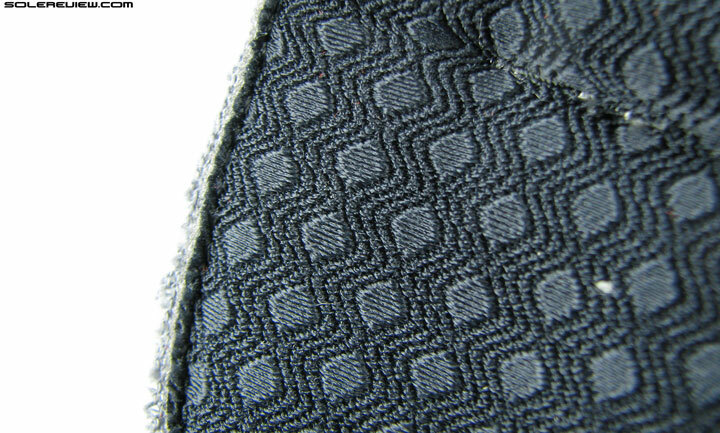 The tongue uses the same fabric as the collar lining. In typical Asics style, no sleeve or gusset here. Expect a moderate level of sideways slide. The tongue lining at close quarters; looks and feels premium. Swapping the lining also makes the tongue flap softer on the foot than before. The collar and tongue lining swap ensures a different fit and feel outcome for the Cumulus 17. Last year, you could feel the firmer collar fill making its bulk felt. In contrast, the softer upper heel lining goes easier below the ankles. The tongue material is a level-up over the Cumulus 16’s. 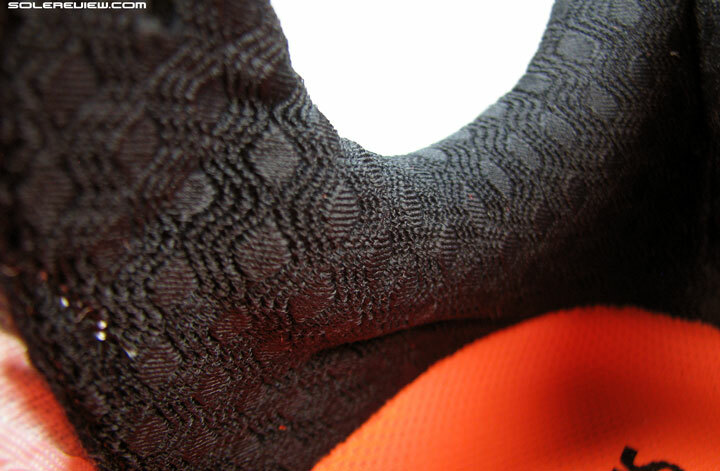 The tongue flap is softer, and by changing both its upper and lining fabric, the component sits gentler over the foot. The Cumulus 16’s laces were firm and short. The single tone laces are much better this time. Mesh change. Functionally not very different, but scores higher on visual appeal. Most of the stitched-on synthetic has been replaced by the no-sew type. Lacing was slightly short on the C-16, and that’s taken care of. The laces were of optimum length, and softer than the two-tone variety used on the earlier model. Visually, the new Cumulus is much cleaner. By getting rid of most stitched-on layering, and replacing that with no-sew overlays, the Cumulus 17 ends up posessing a much sleeker look. The lines also flow much better than the busy landscape of Cumulus 16’s upper, which cuts down on clutter and tidies the overall aesthetic profile. The reflective welds have been re-positioned and downsized. The extent of reduced reflectivity can be seen under low-light conditions. 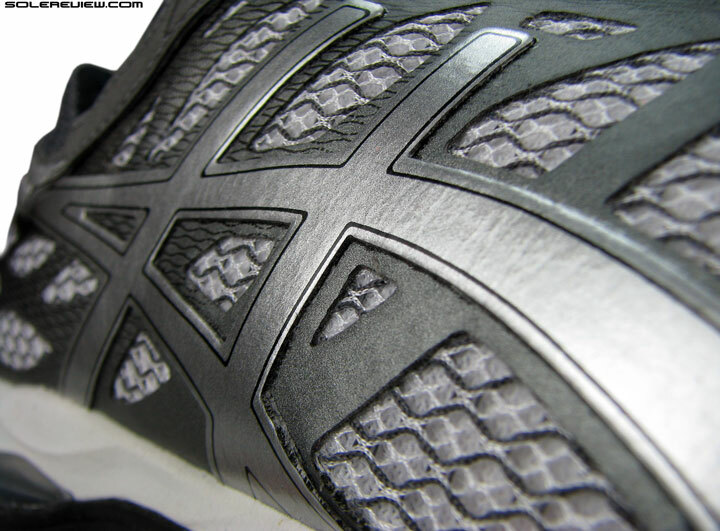 Among other things, the reflective element on the heel shrinks in size. The 2014 model had a reflective wrap-around; no such luck this time, and all you end up with this year is a small cluster of teardrop-shaped bits clumped together. No-sew exterior equals smooth interiors. True or false? True. Ventilation is adequate, if not great. 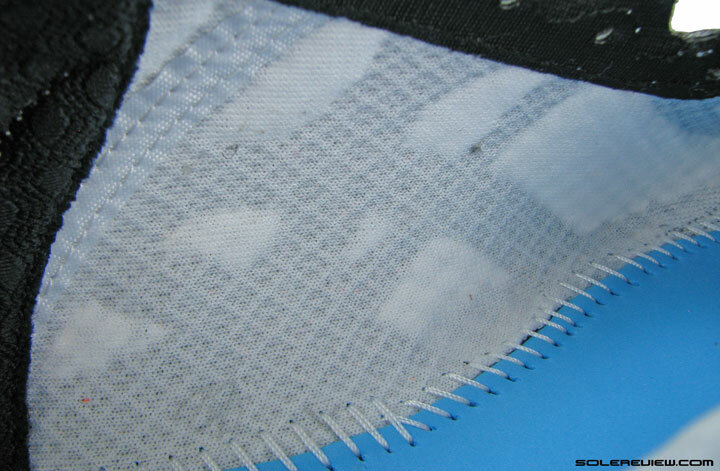 The lack of overlays on the outside also means that there are less stitch-lines on the inside. This enables the interior environs of the 17 to house a smoother lining, which in turn makes for a better fit. No complaints on the toe-box height. There is more room on the medial side of the big toe vs. the Cumulus 16. There is no change in sizing or the toe-box height. But as highlighted a while ago, the forefoot becomes narrower on the Cumulus 17. Yet the resulting sensation is that of greater fit uniformity vs. the 16. The latter had an uneven distribution of forefoot fit pressure; the upper bore down snug on the smaller toe, and had ample space on medial forefoot side, the area between the base of the big toe and the midfoot. But in what sounds completely counter-intuitive, the upper side of the big toe felt hemmed in by the toe-box. This was the midsole’s doing; the sidewalls cut in narrow towards the outsole tip, hence squeezing the tip of the big toe in. 1) Narrower forefoot, but more room on the inner side of the big toe 2)Smoother interior fit 3) Softer collar feel. This fit quality was caused by the Cumulus 16’s upper construction. On the lateral (small toe) side, an overlay ran directly over the forefoot and towards the midfoot; and on the medial side there was no layering at all. 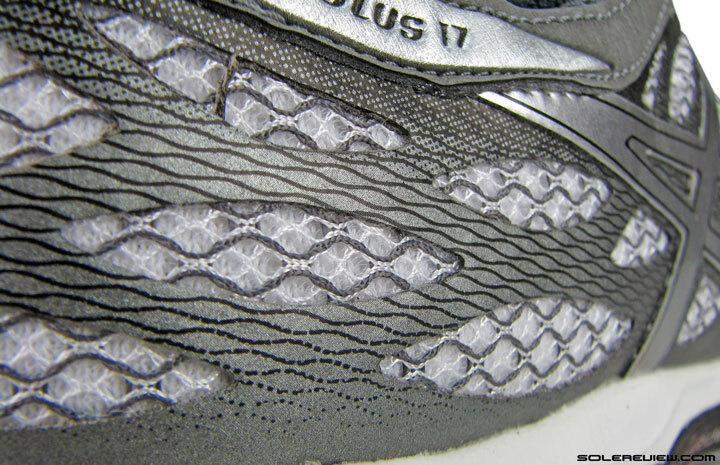 On the Cumulus 17, the lateral forefoot retains the synthetic strip, albeit in a no-sew avatar. But what’s really changed is the design over and around the big toe (medially). 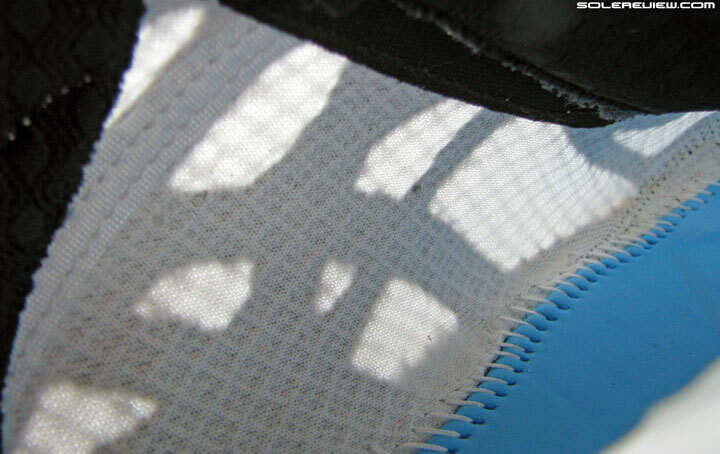 The previously open expanse of mesh now comes reinforced with couple of strips, and this reduces the splay room. Yet, there’s another thing which the Cumulus 17 does differently than the 16. The medial midsole tip comes with a little more margin than before, and in the process, gets rid of the hemmed-in feeling on the side of the big toe. So in a way, the Cumulus 17 exhibits a reverse behavior relative to the Cumulus 16. 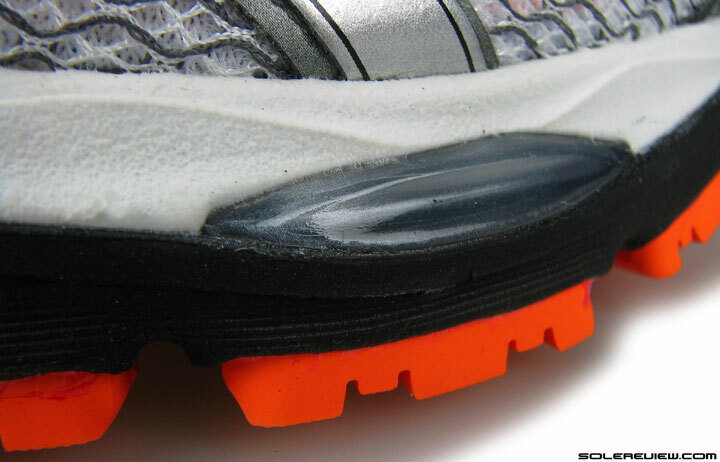 While the forefoot side gets the cramped treatment, that is compensated by more space on the toe-box side. Weird, uh? We view the sum of updates on the Cumulus 17’s upper fit as generally favorable. Forefoot space is reduced, but in the process gains a more even spread of fit pressure, and that hot spot near the toe is eliminated. 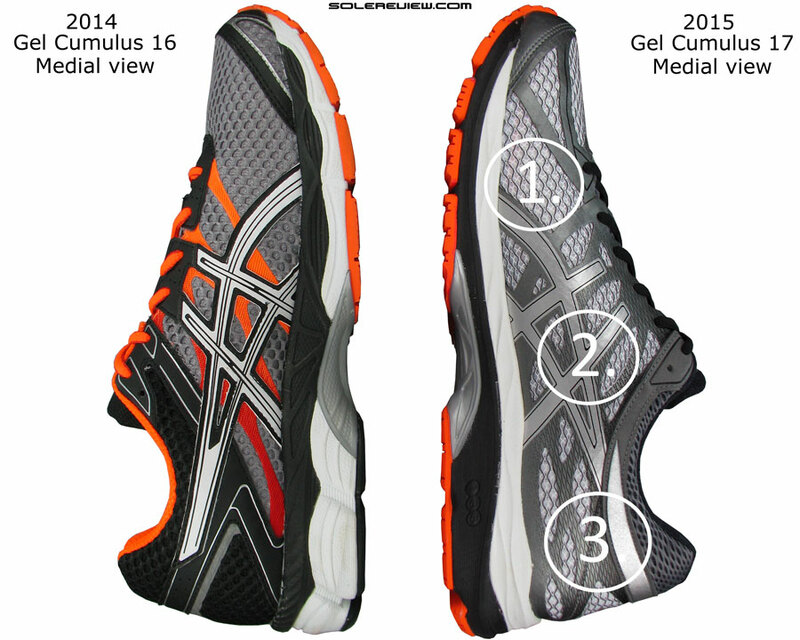 If you’re in a market where Asics sells multiple widths, know that the Cumulus 17 is offered in D (reviewed), 2E and 4E in case you want more splay room. The upper designs and materials are an improvement for sure. The ride’s not bad, but becomes softer for no necessary reason. So there you have it, the new Cumulus 17 – it isn’t better or worse than the outgoing model. The upper is an improvement on fit and feel, yet the midsole ride loses the cushioning balance experienced on the 16. Other things being equal – like price and weight for example – the new Cumulus translates into a zero sum game. Nice upper, yet compromised by a softer midsole. Looking to upgrade your older Gel Cumulus 16 to the latest version, but not sure how the 2015 model compares? We can help here. The following infographic is a ready-reckoner for what changes you might expect in the new model vs. old. To make this more fun, we’ve put in a system of percentage match, which calculates a weighted average for a set of attributes. Great insight once more. Speaking of width and that foreffot space. Considering that Cumulus 16 Dwidth was OK for you in the previous review, would you go for 2E in C17 or stay in the same? Stay in the same size/width. Great review- as always 🙂 I have to say I love the look of this shoe in the featured color scheme- Asics has done a great job on the design. 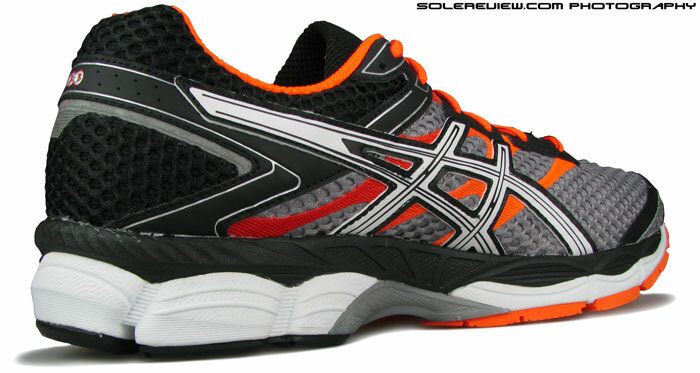 Looking forward to the Kayano 22 review! Thank you! The Kayano 22 is up next! Super excited for that review. 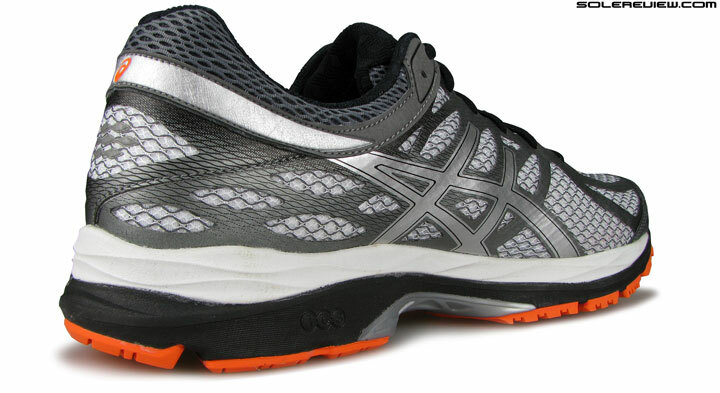 I really like the Kayano 21- a little lighter it would have been great. I hope Asics have not gone mad with the softness tho on the Kayano 22…so basically if they just make it lighter and nothing else, it will be a step in the right direction imo. I feel Asics need to start reducing the weight on the Culmulus, Kayano and Nimbus range next time around. The Kayano 21 for me was almost the perfect shoe for my needs and a much more secure fit than the Nimbus 17.From what I’ve seen, I think they have engineered 3 internal support bands instead of the 1 on the Nimbus to fix that prob. Stay with the Kayano 21, then. Not only is the K-22 softer/heavier, but the upper fit is sloppy compared to the locked feel of the K21. How bizarre Asics going even softer!…I can only assume they are trying to capture that large market of casual runners who like a super cushioned slow ride. Bit surprised tho since the Nimbus surely covers that segment …what on earth are they thinking making the K22 even softer! The comments thread will be closed till Jan 17, 2016. Any inconvenience is regretted. Premium access members can continue to use their dedicated comment section, which will be open.